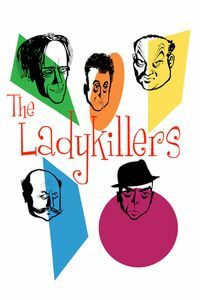 (On TV, July 2018) If you’re looking for an exemplary British black comedy, you could certainly do much worse than The Ladykillers, a deliciously dark story in which five professional criminals team up for a heist that covers every eventuality … except for their little old lady landlord. Their combined resourcefulness is no match for the bumbling ineptitude of their boarding house host, especially when they make her an unwitting part of their plan. While the heist initially goes well, things get more complicated when she discovers the plot and wants no part in it. The criminals then make one fatal mistake: they decide to kill her. But nothing will go as planned. You can guess who remains standing at the end. Katie Johnson stars as the little old lady to be killed, but the star here is Alec Guinness as a mastermind clearly outwitted, while Peter Sellers has an early role as one of the criminals. My memories of the 2004 Coen Brothers remake are far too dim to be useful, but the original British film is decent enough in its own right—perhaps predictable, but no less satisfying for it. It does help that the film was shot in colour even in mid-fifties UK, giving us a funhouse glimpse in the rather gray life of fifties London, stuck between WW2 and the Swingin’ sixties. This is now remembered as one of the best productions to come out of the original post-war Ealing Studios, as well as one of its last before the Studio was sold to the BBC in 1955. It remains a decently amusing film. (On Cable TV, July 2017) One of my least favourite archetypes is the Holy Fool, the innocent that seems protected from reality by authorial fiat. So it is that Being There is built around the notion that we can project higher qualities onto people who don’t really have them. It does so by presenting a child-minded man who, for decades, has never had to face reality. Well dressed, mild-mannered and competent in gardening, he is thrown in the real world following the death of his benefactor, and manages, through a series of convenient misadventures and falsely profound gardening homilies, to become a respected pundit and political confidante, all the way to being considered as a presidential candidate. (Considering the ongoing fallout of the 2016 presidential election, this is far less funny than it must have been at the time.) Considering my distaste for that kind of story, the first act of Being There is actively irritating. Things do improve afterward, as we start seeing other people’s reaction to the protagonist—that’s when the real world comes back to the movie, and the real comedy begins. But there are limits to the material, especially when it’s a one-note premise stretched so thin over more than two hours. Begin There overstays its welcome as it keeps making the same points. 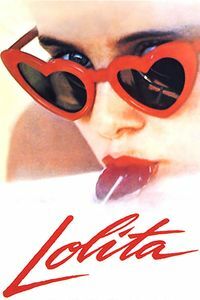 Still, as much as I don’t particularly like the film, there is much to admire in Peter Seller’s performance as the oracular idiot: It takes a lot of skill to act simple-minded while maintaining a credible veneer of respectability, and Sellers is usually able to hit that particular target. (I’m not too fond of Shirley MacClaine’s seduction scene, but the seventies were a special time.) (I’m also not that fond of the ending outtake.) (Although that last shot is growing on me.) I shudder to think of what a modern version of the movie would look like, especially with someone like Will Ferrell in the lead. 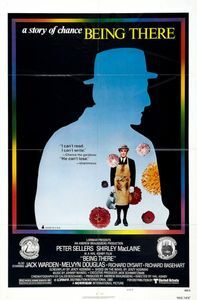 While there are a few things of interest in Being There, the overall effect is more tedious than satisfying—but then again, I didn’t expect to like the film anyway.